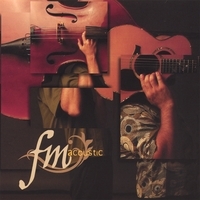 FM ACOUSTIC’s self titled album is the debut album by members Jonathan Fisher and Paul Metzger, long time veterans of the jazz scene in Dallas, TX. Both Jonathan and Paul are graduates of the prestigious University of North Texas Jazz Studies program in Denton, TX and have been playing jazz standards for several years. Jonathan developed the concept for FM ACOUSTIC as a culmination of his love of jazz, classical and acoustic music; and when he began his search for a stellar guitar player to fill out the group, Paul was a natural choice. Jonathan and Paul have been playing gigs and jam sessions together since college and Jonathan has had the opportunity to play many of Paul’s original tunes. The two quickly fell into a groove and their acoustic sound was precisely what Jonathan had in mind for FM ACOUSTIC. Jonathan’s concept for FM ACOUSTIC was to create music that is challenging, unique and melodic with ethnic undertones. Jonathan’s love for arco bass led him to create a project that brings the acoustic bass from a support role to a melodic role. Jonathan’s pursuit of a high level of playing led him to travel to Paris for studies with Modern Bass Virtuoso and pedagogue François Rabbath. Jonathan notes influences of Edgar Meyer, François Rabbath, John Coltrane, Tony Levin and Paul Chambers. Jonathan strives to fully explore the acoustic bass and the tonal possibilities of his instrument. Paul brings an exciting dimension to FM ACOUSTIC with his strong rock and jazz influences. Paul’s pure tone and energetic rhythms are a brilliant match for the arco bass lines demonstrated by Jonathan on this CD. There is also evidence of Paul’s prowess as a strong melodic improviser and unique composer. Paul has long been a fan of acoustic guitar, citing the Beatles, Oregon’s Ralph Towner, John McLaughlin, Pat Metheny and Michael Hedges among his models. Paul also credits University of North Texas Jazz Guitar Professor Fred Hamilton for musical guidance and a deeper understanding of the guitar. Whether as a rhythmic support or a melodic lead, Paul brings a high level of spirited playing to FM ACOUSTIC. Although the group was originally conceived as an acoustic duo, the duo pulled in multi-instrumentalist Joey Carter for two tunes, “Dojha” and “Live Now”, on the group’s self titled album. Jonathan and Paul quickly realized that the addition of percussion completed the sonic concept they had in mind for the group and a trio was born. Joey is well known in the Ft Worth Jazz Scene and is the Faculty Drum Instructor at Texas Christian University (TCU) in Ft. Worth. Jonathan Fisher has been teaching jazz and classical students since 2000. He studied with Francois Rabbath (a world famous double bass teacher and pedagogue), Jeff Bradetich, Lynn Seaton, and Paul Ellison and has a BA in Jazz Bass Performance from the University of North Texas. Jonathan's teaching philosophies are based on the New Technique developed by Francois Rabbath. Jonathan is accepting students of all levels at his studio in Dallas, TX and teaches on Saturdays. His rates are $50/hour. All About Jazz musician pages are maintained by musicians, publicists and trusted members like you. Interested? Tell us why you would like to improve the Jonathan Fisher musician page.